Enough cannot be said about Florence, birthplace of the Italian Renaissance and home to many of the greatest artists of the era, from Michelangelo to Leonardo da Vinci. 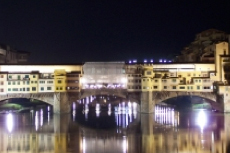 From the famous Duomo to the Uffizi, there is much to see in this storied city. Again, lots of walking (got 20,000 steps on my fitbit). Again, lots of walking (got 20,000 steps on my fitbit). Excellent tour guide who brought us to a restaurant he recommended for lunch and he pre arranged we all had seats on a busy day in Florence. (Samtheguide.com). It was the Easy Florence tour. Free time to explore the city. It was 38 degrees celsius the day we were there so that was difficult, but it is a lovely historic city similar to Rome. We did the Florence with Tuk Tuks, our driver was really kind and took his cues from us. We did the Florence with Tuk Tuks, our driver was really kind and took his cues from us. We were able to travel above the city for some great views. Wonderful guide that truly loves Florence! Best port. Don&apos;t waste time at Pisa--spend the most time you can in this enchanting city. What a great and beautiful city. What a great and beautiful city. So much culture and history. This tour allowed us some free time as well to experience Florence on our own. Great tour. Again, very expensive for a ride into town. I took the 10 hour tour which cost $209. We did "Florence on Your Own" and had a great day. We did "Florence on Your Own" and had a great day. Our tour guide provided a lot of information on the way and was very entertaining. I can&apos;t say anything bigger than I SAW DAVID!!! "Michelangelos David & Florence: a fabulous tour with Sami. "Michelangelos David & Florence: a fabulous tour with Sami. Plenty of time to look at the David. Again was rushed saw lots of places, had time on our own but not long enough. Driven to Florence where we met our guide. Driven to Florence where we met our guide. She walked us around for two hours showing us the main sights in Florence. Afterwards we had ample time to explore Florence on our own! We opted for the cruise line bus into Florence with all of the time to walk on our own. Our second time in Florence; nice walking tour to review the sites and then free time. Our second time in Florence; nice walking tour to review the sites and then free time. The tour was not well organized in that there was far too much free time after the tour - 4.5 hours of free time is unmanageable. Tour guide was really good. John gave good suggestions for the On Your Own Tour. John gave good suggestions for the On Your Own Tour. He&apos;s very thorough and helped with customized maps.